A lovely way to hold your treasures! 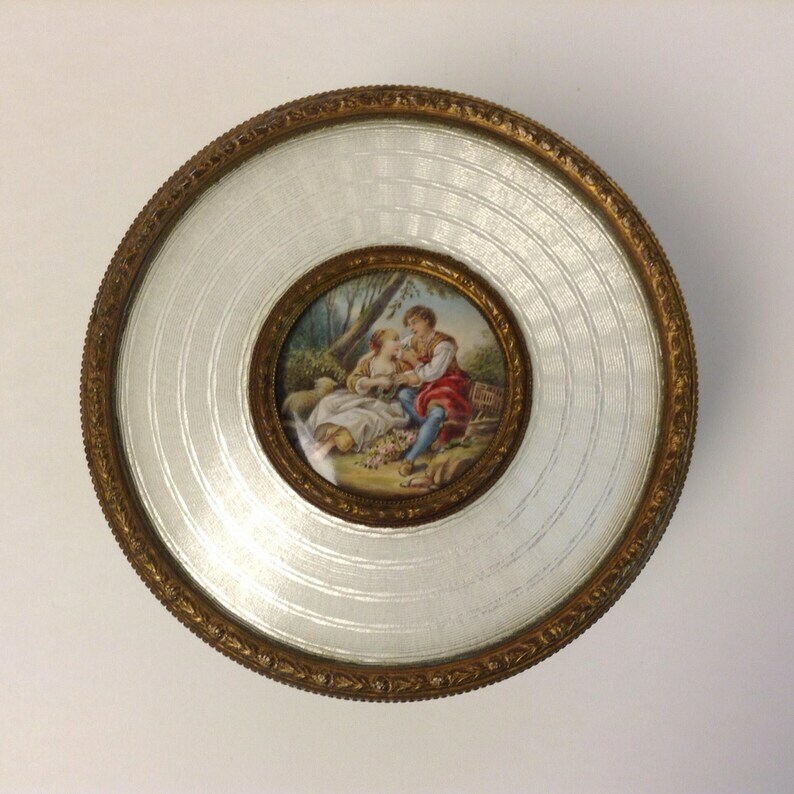 This gorgeous guilloche enamel and ormolu trinket box for jewelry features a miniature portrait of a courting couple. The piece is actually American-made - inspired by what the French were producing. The lidded bowl sits flat on three ornate and detailed feet. The outside of the lightweight bowl is embossed with an animals, vines and leaves motif; the inside is smooth. The weight to this piece is in the lid - it's heavy - weighing six ounces! The white enamel, engine turned guilloche resembles ribbons and is textured to the touch. The lid fits snugly on the bowl and is heavily detailed on the rim as well as the lid edge. The same motif of embossed animals, vines and leaves appears on the underside. The unsigned, hand-painted porcelain portrait of a courting couple is beautiful and packs so much detail into such a tiny space - the loving expressions and the clothing along with flowers, animals, trees, rocks and foliage. The color is fabulous. The miniature portrait is housed under glass and finished in a beautiful detailed metal frame. The unmarked piece is in excellent antique / vintage condition. The outside has mellowed into a beautiful bronzed patina while the inside is a much brighter gold color. The enamel is clean, intact and scratch-free; the porcelain portrait as well. There is some verdigris in spots along the lid rim, the feet and on the underside of the feet where they attach to the bowl. There are also a couple of dents visible from the inside where one of the feet attaches to the bowl - but nothing that seriously detracts. The casket measures 2 1/4" high with lid (1 3/4" without) by 4" in diameter at rim. The center portrait is 1 3/4" in diameter at outer frame edge. The piece weighs close to 9 ounces. A wonderful casket - perfect for jewelry or other small items on one's dressing table.